Nirad C. Chaudhuri or Nirod Chondro Choudhuri was born in (23 November 1897 in Kishoreganj, which today is part of Bangladesh but at that time was part of Bengal, a region of British India. He was educated in Ripon College, Scottish Church College and University of Calcutta. He started his career as a clerk in the Accounting Department of the Indian Army. Bangali Jibane Ramani ,Atmaghati Bangali, Atmaghati Rabindranath are his well known Bangla writing. The Autobiography of an Unknown Indian, A Passage to England , The Continent of Circe, The Intellectual in India,To Live or Not to Live etc are his well known English writing. 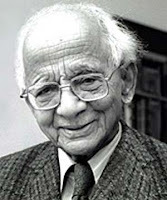 Nirad C. Chaudhuri was awarded the Sahitya Akademi Award, in 1975 for his biography on Max Müller called Scholar Extraordinary, by the Sahitya Akademi, India’s national academy of letters. In 1992, he was honoured by Queen Elizabeth II of the United Kingdom with the title of Commander of Order of the British Empire (CBE). His 1965 work The Continent of Circe earned him the Duff Cooper Memorial Award, becoming the first and only Indian to be selected for the prize. Nirad C. Chaudhuri died in 1 August 1999 in oxford, England.